For my birthday this year I made Fannypack take me to Tuc Craft Kitchen. I’ve actually never heard of them and it was through looking on Urbanspoon for ratings and looking up menus, did I decide to go there. 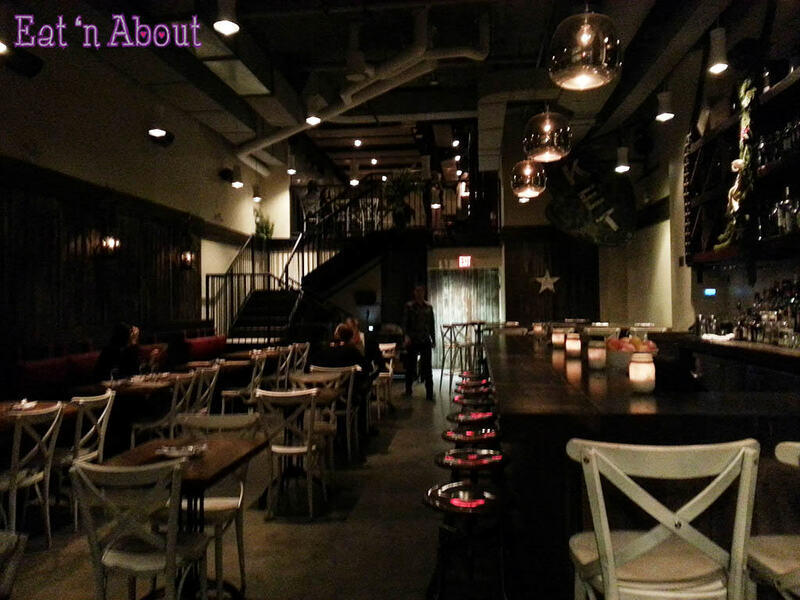 We came on a weekday quite early, so the place was quite empty. But towards the end of the dinner the place was really packed. 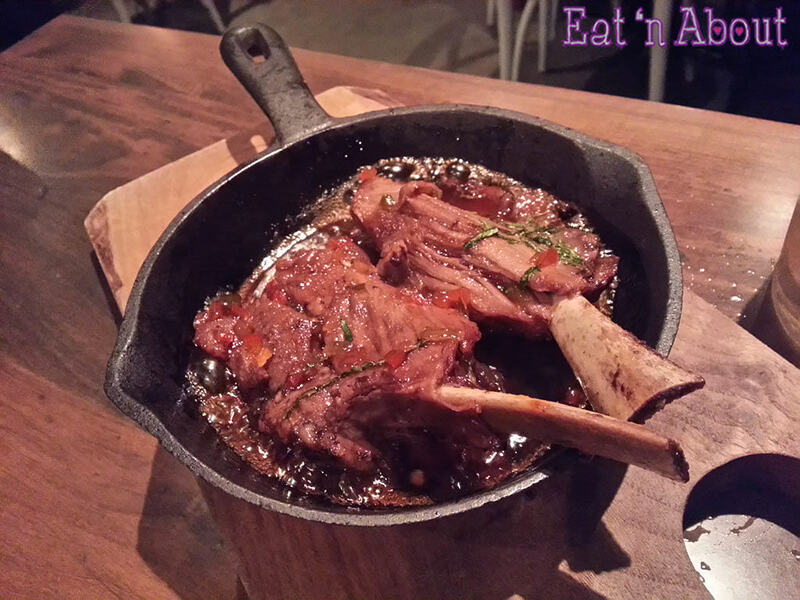 Fannypack never was a fan of lamb, but because it was my birthday, she agreed to share the Orange Glazed Lamb Ribs ($10) with me. This dish is also apparently one of Tuc Craft Kitchen’s signature items. Fortunately for Fannypack, the lamb aroma was not overwhelming, and the meat was very tender. I was glad that the orange glaze didn’t sweeten the dish too much. There was more than enough meat for us to share and this was definitely a big-portioned starter. Another one of Tuc’s signature items was the Crispy Bacon & Egg ($4) so of course I had to order it. 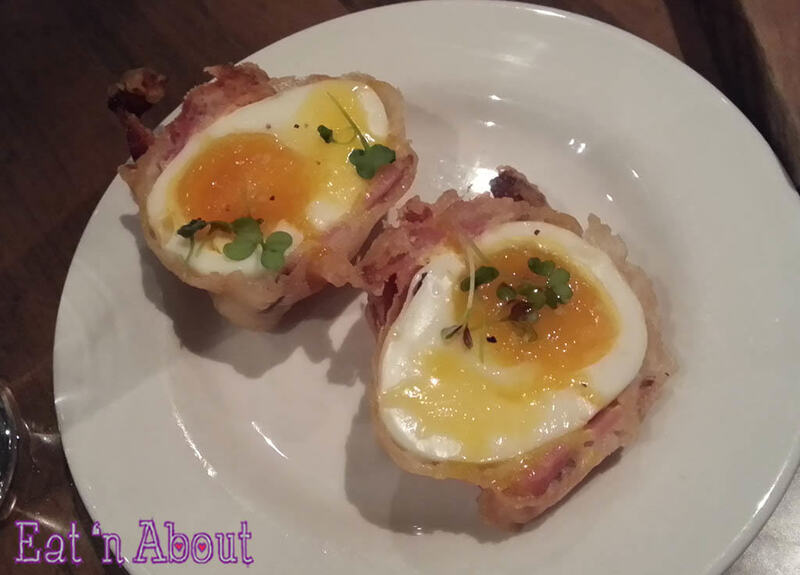 It’s exactly as the name states- eggs wrapped in bacon, battered and deep-fried. The eggs were nicely soft-boiled and it was really yummy. I like that they weren’t greasy either. That’s all I got to say about that. Fannypack’s choice of the night was the Pacific Seafood Stew ($21). 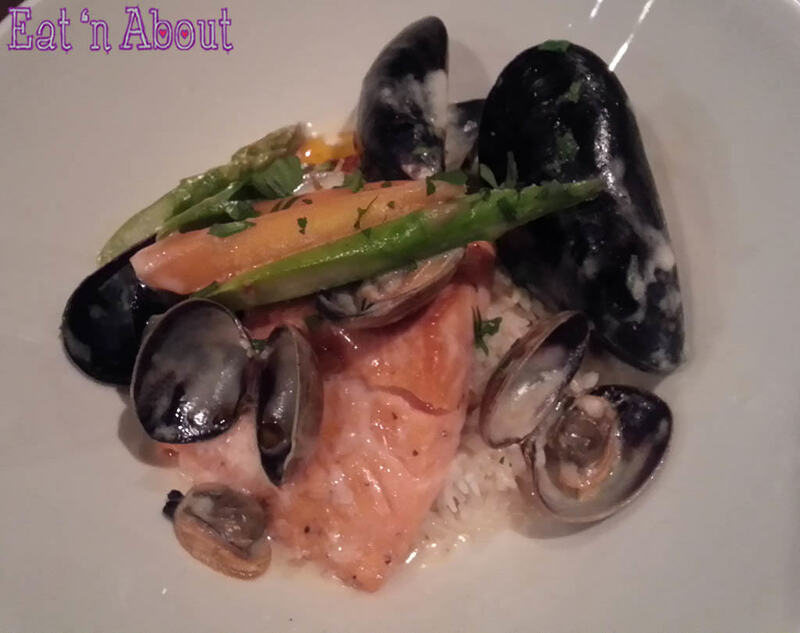 It’s supposed to have pacific oysters, lake louise steelhead trout, manila clams, and salt spring island mussels on top of basmati rice, in a lemon grass & white wine broth. Looking at the picture though, it doesn’t look like there were any oysters, but I didn’t confirm with Fannypack. I had a few bites and I thought this stew tasted more like a thai curry dish than a stew. I found it unusual to be served on top of rice. I had the Cabernet Braised Beef Cheeks ($22). 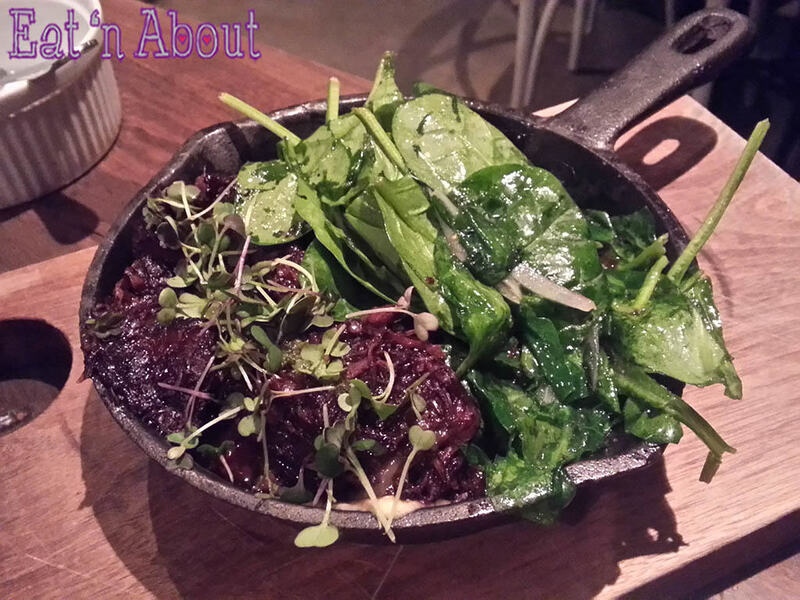 The beef cheeks were in a red wine glace, and in the same castiron pan were the gratin potatoes, shallots & wilted spinach. It was kind of weird to have the gratin potatoes, which were like mashed potatoes, in the same pan. They became even more mushy after sitting in the red wine glace. It didn’t taste bad, was just weird to me is all. The meat was very succulent and moist. Portion looked small but by the time I finished the starters and got to the entree, I was pretty full so this was a good size. It was my birthday, so of course there’s dessert. Actually, there’s ALWAYS dessert. I decided to get the Doughnuts ($5) since I have a soft spot for fresh doughnuts. 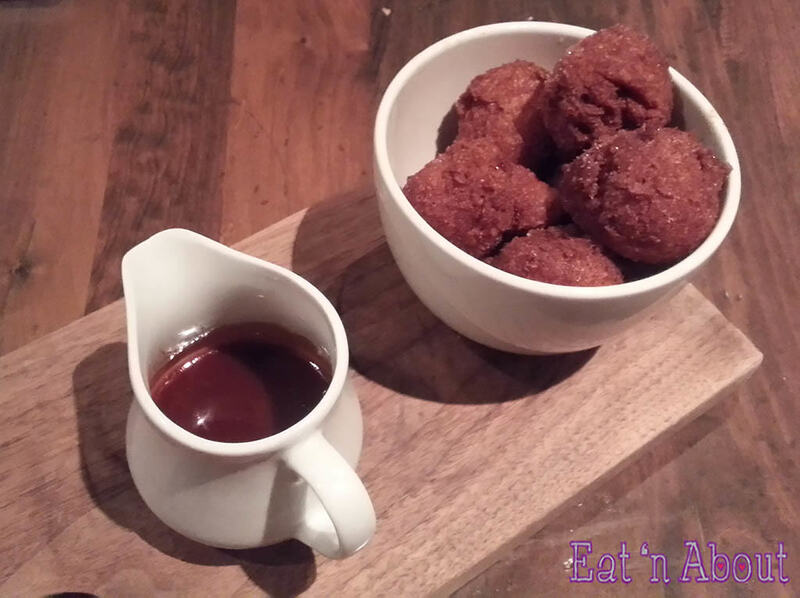 Unfortunately, just like the beignets I had at Shaughnessy Restaurant during dine out, these will very oily. It felt like biting into balls of oil. Again I think the oil wasn’t hot enough or something so the batter just soaked up with oil. Even the spiced rum caramel sauce didn’t salvage it. Also, I’m not sure why the doughnuts were so dark either. Old used oil?